Amazon has announced that its Kindle Daily Deal promotional campaign has reached the UK, with a new book offered up at a cheap price every day. The 'daily deal' initiative has been around in the US for a while and while the US Amazon site supports any Amazon Kindle from outside of the US it is great to see the UK get some bargain love as well. On a blog, Amazon said about the new deal promotion: "Today we're launching the Kindle Daily Deal where we unveil a Kindle book at a specially discounted price each day – for that day only. "You'll save big from the previous day's price so to ensure you don't miss a deal, check back daily or follow us on Twitter or Facebook. The first Kindle Daily Deal is Where the Shadows Lie by Michael Ridpath. Get it today for £0.99 – a savings of 75 per cent from yesterday's price." The launch of Kindle Daily Deal is great but does little to get the sour taste out of our mouths that we are not going to get the Amazon Kindle Fire for some time yet. 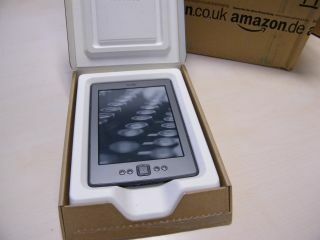 To find out more about Amazon Kindle Daily Deal, head over to: www.amazon.co.uk/KindleDailyDeal.